Right in the centre of Brussels you can find the old Stock Exchange building (Beursgebouw or La Bourse). It’s a very central location that’s often used a meeting or reference point for locals and tourists a like. Recently the city announced that they plan on converting the space in to a Brussels Beer temple. Even though Belgium is probably best known for all the beer we have here, there hasn’t really been a museum or exposition to promote our favorite beverage. Until now! The city recently approved the plans and the Beer temple is scheduled to open around 2018. 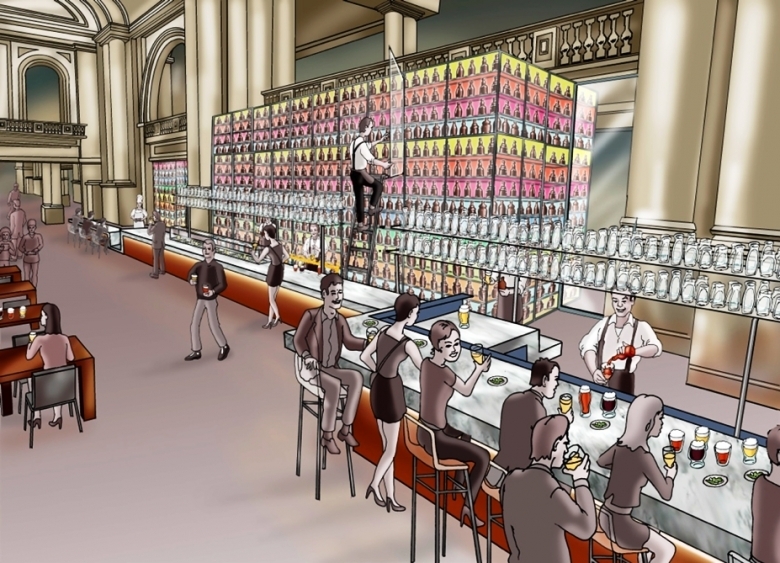 The beer temple, which will be managed by the city as well as the Federation of Belgian Brewers will turn the old Stock Exchange building in to the centre of the Belgian beer brewing culture. The city hopes that this beer temple will become one of the main attractions of Brussels. Sven Gatz, the director of the Federation of Belgian Brewers said that “we have an international reputation to maintain and we also want to emphasize our knowhow in brewing”. With the project the city would like to boost tourism in Brussels and promote our Beer culture to international crowds. A recent poll showed that 20% of people would visit Brussels just to visit the Beer temple. Tourism minister Philippe Close said that the future location is great, claiming that “the strong connection that the building has to the centre of the city makes it very appealing” to tourists who presumably wouldn’t have any problems finding it or have to take special transport to reach it. Until now the basic plans of the project, along with the architectural specifications, the budgets, the financing and the profitability study have been concluded. Projections show around 400.000 visitors could visitors the beer temple every year. The project is now entering the implementation phase. Once the renovation works are complete there will be several different areas - a reception area, an area to taste and explore Belgian beers and the archeological “Bruxellae 1238” which will be fully assimilated in to the beer temple. There will also be a restaurant, an area for seminars and of course a shop. The usable space amounts to a total of more than 12000 square meters. Politicians seem to be promoting the area to be used as a place for meeting, for seminars and for expositions and less on the real joy and history of Belgian beer.